MiloDesign is me - Sally Milo, with a bit of assistance from my partner, Kyle Bennett and a couple of my eBay pals. I have been Milo Design - a graphic designer - since the days when "cut & paste" meant using an Exacto knife & rubber cement or melted wax. In 1990, I met my first Macintosh & learned how to cut & paste electronically & draw with a mouse. I've been an illustrator since I held my first crayon. Early in 1999, my friend Wayne (AzBCC) asked me to set up & manage his eBay auctions as I was the only web-savvy person he knew. All I knew of eBay at that time was that my youngest sister had sold some of her daughter's baby clothes on the site. Wayne agreed to pay for my first eBay purchase (a $15 CocaCola can bank) so I could learn a bit about how eBay works. I was soon using his fancy Sony Mavica camera (the floppy disk one - which I inherited & used until mid-2010!) to photograph coins from his retail coin shop. He provided the descriptions, I did the template design & layout & started listing thru eBay's SYI form. I graduated to MisterLister to enable me to bulk list auctions and eventually discovered Sellers Assistant Pro, which saved me many hours in listing & tracking sales. When Blackthorne was released, I found that even better for managing my eBay listings! I've since switched to SixBit - a program I highly recommend to my fellow sellers! In the spring of '03, I started selling items for local individuals & businesses as an eBay Trading Assistant. I became a PowerSeller on my own in my first 3 months and was recognized on eBay in September, 2003, as PowerSeller of the Month. For about a year and a half, I taught eBay classes at Tucson's Pima Community College and eventually decided teaching classes there was not my calling. Although I've created eBay listing templates for myself & other sellers since I began selling on eBay, it's only been since the beginning of 2007 that I've made eBay design a greater focus. I'm back to my design roots & I'm loving that! My other eBay passions are posting on the Community discussion boards & helping others to use SixBit. I was a member of eBay's Voices of the Community for nearly 3 years. I'm also and Certified eBay Stores Designer and was an eBay Education Specialist for a couple years. Once or twice a year I attend a special eBay event such as eBay on Location or the eBay Radio Party - events I recommend going to! Contact me via email or phone - 520.270.6456. Every month or so, I send out a newsletter to my eBay friends, acquaintances and clients who wish to receive it. I discuss topics of interest to many eBay sellers. To subscribe, sign up here. Over my years on eBay (since 1999), I've created several tutorials to "pay it forward". Some of these are eBay guides, some are on my website. • Get found, get noticed & get growing! • Your shoppers expect a professional experience! Give it to them and show them who you are. • eBay Stores: New Store or Classic  Which is Best for Your Business? In addition to my FREE SixBit Quick Start Guide, I offer remote one-on-one training and consultation for using SixBit. Please see my listing for training in my eBay store! In the column to the left, I mention my training of SixBit. But, that's not all I offer! I also can show you how to use Photoshop for your eBay photos or other projects. I'm a knowledgeable eBay seller who loves to work with others remotely; we talk on the phone as I show you how to do things on your computer. If I don't have a listing for the training you'd like, please email me & I'll create a listing just for you (or will refer you to one of the experts I work with)! My 15 Minutes (2 Seconds) of fame... 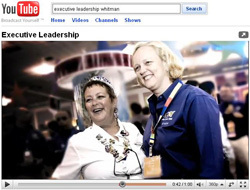 In the last week of February, 2010, former eBay CEO and California Gubernatorial Candidate released the commercial below. I was surprised to see myself in an eBay Live 2005 photo at the 42 second mark. Click image below to see full commercial. 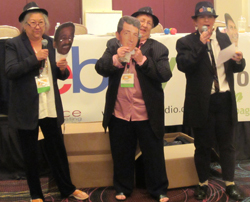 At the June, 2013, eBay Radio Party, 2 of my fellow sellers and I dressed up and presented some parodies of the Rat Pack - Frank, Dean & Sammy. See and listen to us by clicking photo below. For further info about MiloDesign and helpful links and tutorials, please visit my website.